Following the rumours on the rounds about the move of Arsenal forward, Alex Iwobi, Arsenal manager, Unai Emery, has revealed that he is not releasing any players until he worked with them to ascertain if they are to go or not. This came after there was reports online linking Alex Iwobi to a move to Italian giants, Lazio. He added that, “This week, Mesut, Elneny and Iwobi are starting to work with us and our first impression is very good with them. The former Sevilla manager spoke ahead of Arsenal’s tomorrow’s friendly against Paris Saint-Germain. 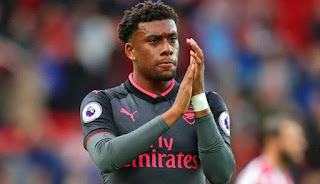 This was in confirmation of earlier report by The Sun UK, that the 22-year-old Iwobi will remain at the Emirate Stadium and pocket at least £18.2 million (approximately N8.65 billion) over the duration of his new five-year deal.